Wheat continues to go through the heading and flowering growth stages across central and northern Ohio. Depending on the weather and the variety, flowering usually occurs about 3-5 days after full head emergence (Feekes 10.5) – earlier under warmer conditions and delayed by up to 5 or more days after heading under cooler conditions. 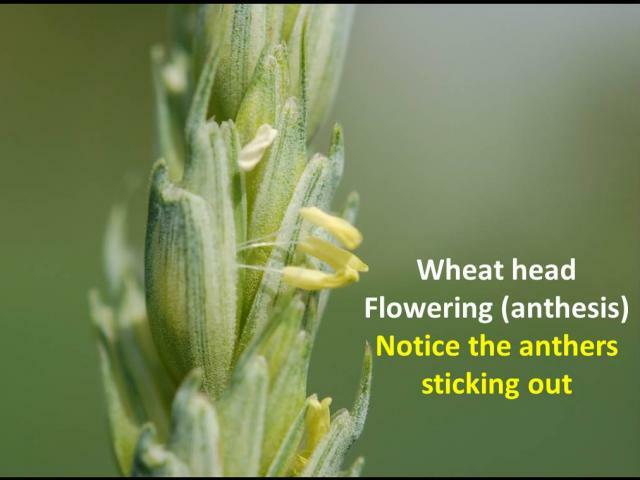 Flowering is marked by the extrusion of anthers from the spikelets; the reason for which this process is also referred to as anthesis. Flowering will continue over the next 7-10 days. The identification of this growth stage is very important for the management of Fusarium head blight (head scab) with fungicides. Note: When trying to identify these growth stages, based your assessment on the presence of fresh (brightly colored) anthers, since dried, discolored, and spent anthers may remain hanging from the spike well after Feekes 10.5.3 and well into grain filling stages of development. This can be misleading.